This robin (Turdus migratorius), carrying what appears to be a grasshopper, paused for a few moments on a rail fence on Middle River Road as I passed today. The relative brightness of its breast and darkness of its head argue that it is a male. (Confidently sexing an adult robin takes some experience, as any birder will tell you.) He is probably carrying it to a nest. 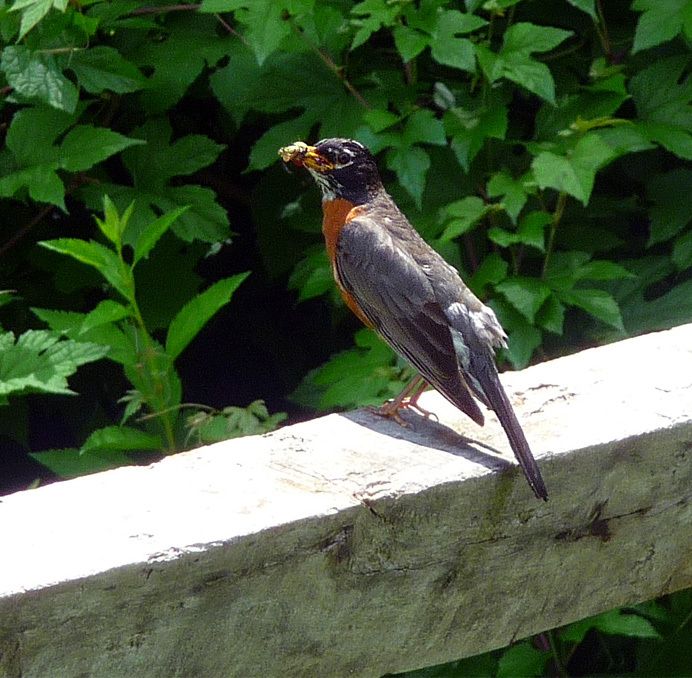 Male robins help to feed their young. The bird's head and back feathers appear unkempt because he is molting. New feathers, pushing out the old, will last until this time next year. The wing feathers, also good for a year, look neater because they were replaced several weeks ago. Only about one in four robins reach their first birthday, but those who survive usually live five or six years. The oldest banded robin ever recaptured was one month shy of 14. Captive robins have lived past 17. The scientific name Turdus doesn't mean what some folks think. It's Latin for thrush, the genus to which robins belong.